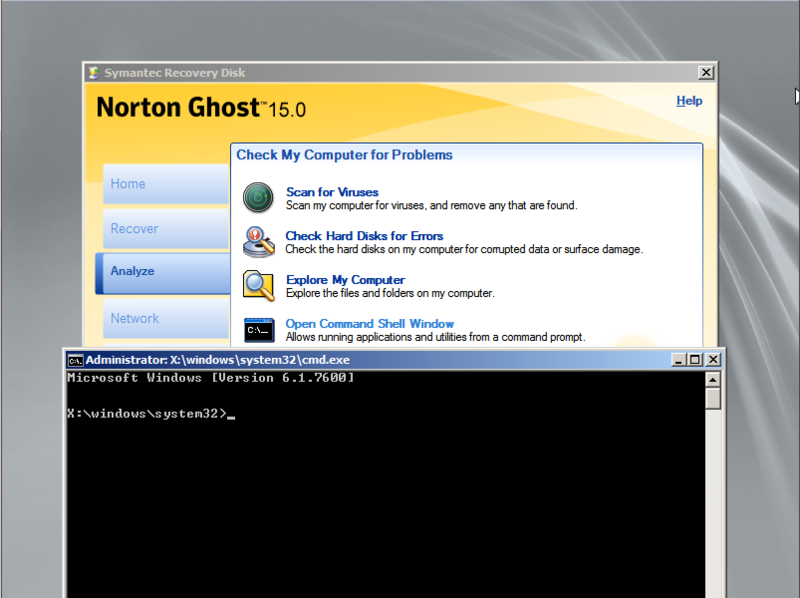 How to build the Ghost 15 SRD on Windows Preinstall Environment 3.0 by redk9258 - June 18, 2010. - Ghost 15 SRD (install disk) or ISO file. - Your Ghost 15 key. Right click the Ghost tray icon and click "About". - 7-Zip. Download version 4.65 from http://www.7-zip.org. We will use this to extract files from ISO and WIM files. Note that version 9.14 has a bug that will not open the boot.wim file from the Symantec disc. Install 7-Zip and the Windows® Automated Installation Kit (WAIK) on your computer. Now let's build the SRD on WinPE 3.0. DO NOT close the command prompt until instructed. Open a command prompt with administrative rights and navigate to C:\Program Files\Windows AIK\Tools\PETools. You'll notice that the command prompt has changed to the correct directory. Now add the winpe-hta package to winpe.wim. Type: Dism /image:mount /Add-Package /PackagePath:"C:\Program Files\Windows AIK\Tools\PETools\x86\WinPE_FPs\winpe-hta.cab"
Now add the Ghost SRD files to the new mounted wim file. Using Windows Explorer browse to the Ghost 15 CD or ISO file. If it is an ISO, open with 7-zip. Now go to sources\boot.wim. Open this file with 7-zip. Copy \1\SymDrivers.xml and \1\SymInfo.xml to C:\windowspe-x86\mount. Copy the folder \1\Windows\Shell to C:\windowspe-x86\mount\Windows. Now close all Explorer and 7-zip windows that are open so we don't interfere with the next step. Now using Windows explorer, copy all of the contents from the Ghost 15 CD (or ISO opened with 7-Zip) to C:\windowspe-x86\ISO. When asked to overwrite files click NO. Now at the command prompt type: OSCDIMG -l"NGH15 SRD on WIN PE 3.0" -n -b"etfsboot.com" ISO "NGH15 SRD on WIN PE 3.0.iso"
You should now have a file named "NGH15 SRD on WIN PE 3.0.iso" to burn to CD that runs on WinPE 3.0 with your license key in it. You may now close the command prompt. Or for the people who do not want to copy and paste all of those commands here is a batch file. This is slightly different in that it does not use 7-Zip. You can save this text as GHOST 15 SRD ON WINPE 3.0.bat Right click and run as administrator. You will still need the Windows® Automated Installation Kit (AIK) for Windows® 7. REM Must run as administrator. DISM /image:mount /Add-Package /PackagePath:"%waikdrive%Program Files\Windows AIK\Tools\PETools\x86\WinPE_FPs\winpe-hta.cab"
OSCDIMG -l"%isoname%" -n -b"etfsboot.com" ISO "%isoname%.iso"
Re: How to build the Ghost15 SRD on WinPE 3.0..
Notice the different version number 6.1.7600 (Win 7) and the different background. Just amazing work! Both methods are easy to perform but the batch file is easier. Thank you very much redk9258. I was easily able to make it following your instructions. I haven't had time to try the batch file yet but the one I already made is working great and I have done backups and restores with it. Much thanks to Brian K and Dave H for testing this for me! It's too bad that download is soooo freakin' big for the WAIK package. BTW, once you have this package, you can make WinPE discs / flashdrives to do many things- like boot off of a flash drive and use Firefox Portable to go to the the forums here to ask Brain K, Dave H and Allen for help when your computer doesn't boot . There is a lot of stuff to read in the instructions, but it's not too hard to learn. Type: Dism /image:mount /Add-Package /PackagePath:"C:\Program Files\Windows AIK\Tools\PETools\x86\WinPE_FPs\en-us\winpe-hta_en-us.cab"
I don't see any difference, but I have would do it since MS says so. Oh excellent, so does this solve this problem? I'm not sure. Somewhere in that thread it was suggested the error "please insert the recovery disk" was caused by a driver problem from WinPE 2.0. I have never seen that error so I cannot say for sure. I would be curious to see if that resolves the problem though. Well I've just tried it and get same problem as before. Restored a Ghost 2003 image of Windows XP SP3, then used Ghost 15 to create a new image, then tried to restore back and noticed that "Restore Anywhere" option is automatically checked and greyed out (and it only does this on our Dell PCs and only with XP). Subsequently the restoration failed. The problem in that thread was about Ghost asking to reinsert the SRD even though it was present. Is that the error that you are receiving? Why does it automatically check the "Restore Anywhere" option? I didn't ask for it and it doesn't do it for Vista or 7 images. Yes, but I didn't want it to perform a "Restore Anywhere". OK, this is a different error and it simply quits when you click OK (going back to the menu). PCs affected are a pair of Dell Precision T3400, Core2Duo 2.66GHz, 2GB RAM, NVIDIA Quadro NVS 290 using a clean install of XP Home and XP Professional with Service Pack 3 installed, NVIDIA drivers version 197.28, F-Secure Client Security 8.02. Images created from SRD with Medium Compression, Verify Recovery Point and split at 3857MB options set only (although the images generated are actually little bigger than 2GB). When restoring image, only options set are Verify Recovery Point, Set Drive Active and Restore Original Disk Signature. Have the computers that you are having this problem with been booted? Is the image taken from the same PC? Something is making Ghost think that you are restoring to different hardware. I'm not sure what triggers it because Ghost is not supposed to be able to do that. If you were using BESR 2010 (the enterpise version of Ghost), I'll bet you can uncheck that greyed out box. That missing SMEUTIL driver may be included with BESR. You could try one more thing. Install Ghost 15 on the machine thats is giving this problem and make a backup from within Windows. When you do it this way, Restore Anywhere is disabled. I've been searching for information about SmeUtil. The only references I can find mention Deploy Anywhere and Ghost Solution Suite. 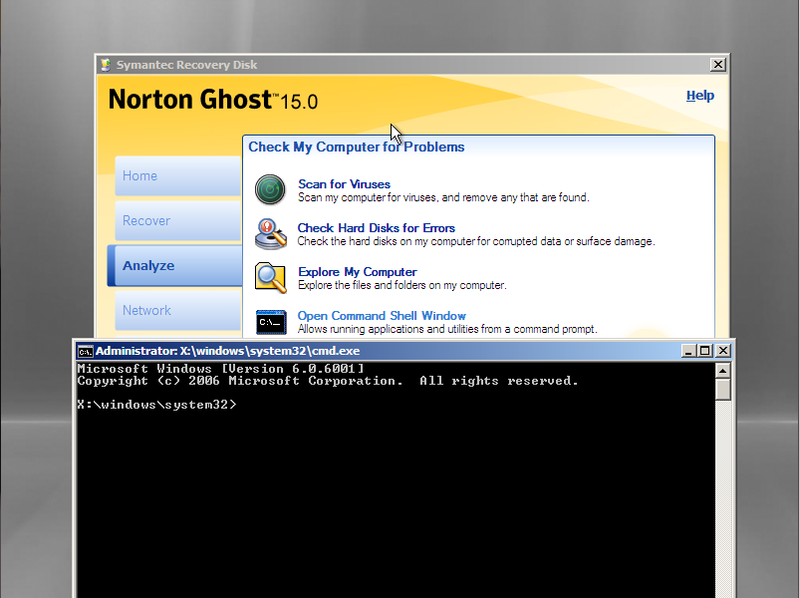 I think there was something done by your old verion of Ghost to make Ghost 15 want to run Restore Anywhere. Was the original gho image file made by the consumer version of Ghost 2003 or from Ghost Soloution Suite? Was the PC sys prepped before the image was taken? That may trigger Restore Anywhere. Maybe if you contact Customer service and explain this problem they would let you download the BESR SRD. You could then try the restore by unchecking Restore Anywhere. It didn't get transfered over to the Win7 wim? No, I did not put it in the batch file because I did not know about it. I wonder what else is missing then. Also, his original SRD should have worked because it had the driver. I wonder how I could find out what other drivers or files were added on top of the Windows PE base. Do you know if it is sufficient to just copy the sys file or does it have to be registered in the registry? Can you extract that file from the original boot.wim file using 7-Zip and use the load driver function to see if that solves the problem for you? I went through and compared the folders of WinPE 2 and WinPE 3. In addition to SmeUtil.sys that Dave found, there were 4 fonts that look like they were added to WinPE 2 (COUR.TTF, COURBD.TTF, COURBI.TTF and COURI.TTF). So, in addition to SmeUtil.sys I am copying them in my new batch file. There was also a driver named DLKRTGB.SYS it appears to be a DLINK driver. I did not copy it. I also noticed actprxy.dll and msvcr71.dll. There are also in the Shell folder so I did not copy them. If someone thinks they need copied to the system32 folder, let me know and I'll revise the batch file again. I also added mdac, scripting and wmi packages..
DISM /image:mount /Add-Package /PackagePath:"%waikdrive%Program Files\Windows AIK\Tools\PETools\x86\WinPE_FPs\en-us\winpe-hta_en-us.cab"
DISM /image:mount /Add-Package /PackagePath:"%waikdrive%Program Files\Windows AIK\Tools\PETools\x86\WinPE_FPs\winpe-mdac.cab"
DISM /image:mount /Add-Package /PackagePath:"%waikdrive%Program Files\Windows AIK\Tools\PETools\x86\WinPE_FPs\en-us\winpe-mdac_en-us.cab"
DISM /image:mount /Add-Package /PackagePath:"%waikdrive%Program Files\Windows AIK\Tools\PETools\x86\WinPE_FPs\winpe-scripting.cab"
DISM /image:mount /Add-Package /PackagePath:"%waikdrive%Program Files\Windows AIK\Tools\PETools\x86\WinPE_FPs\en-us\winpe-scripting_en-us.cab"
DISM /image:mount /Add-Package /PackagePath:"%waikdrive%Program Files\Windows AIK\Tools\PETools\x86\WinPE_FPs\winpe-wmi.cab"
DISM /image:mount /Add-Package /PackagePath:"%waikdrive%Program Files\Windows AIK\Tools\PETools\x86\WinPE_FPs\en-us\winpe-wmi_en-us.cab"
Great work but I had one little problem. CD /D "%waikdrive%Program Files\Windows AIK\Tools\PETools"
I got it building now, let you know in a while the outcome. I want to stop at your pause and try adding a portable folder. I saw some errors right before the pause and a few more later. I have the recovery disk extracted to a folder D:\G15 and was using that as a source. I don't have time to figure it out right now, it's getting late and I got to get going home. Have the computers that you are having this problem with been booted? Yes. Not only booted but restored a Vista image, then rebooted and tried to restore the XP image I create earlier. Is the image taken from the same PC? Yes, the exact same PC. I create the image on the PC, then restore it at a later date. It preselets the "Restore Anywhere" option, which causes the error that is described in the linked-top thread I posted earlier. Something is making Ghost think that you are restoring to different hardware. I'm not sure what triggers it because Ghost is not supposed to be able to do that. If you were using BESR 2010 (the enterpise version of Ghost), I'll bet you can uncheck that greyed out box. That missing SMEUTIL driver may be included with BESR. Yes, I don't know why but it doesn't do that (preselects the Recover Anywhere option) when I restore a already-created Vista or 7 image to the same PC, only with an XP SP3 image. Funnily enough, when I do the exact same procedure of creating an image of XP (this one has SP2) then restoring it at a later date on another PC (which is a custom PC with Pentium 4 3.06GHz with HT, ATI Radeon 9600 Pro, 512MB RAM), it doesn't preselect the "Restore Anywhere" option and it works perfectly fine. The "missing SmeUtil driver" doesn't come up with the original disc, it comes up with this newly-built one though. I can't because the PCs we work on are test PCs, which we use to test various software products, therefore they must have absolutely nothing installed on them, save for antivirus software and drivers. This is why we make use of the Ghost boot discs to perform a full imaging of the OS and restore them whenever we need to. This is no doubt because of the "Recover Anywhere" option that is set and can't be changed. Yes, obviously the driver database directory can't be found, because it's not a custom SRD with the drivers on and I didn't want it to "Recover Anywhere" anyway! Is it possible that the recovery disc that Ghost is looking for is a Windows disc that Dell would ship with the PC? My problem was I didn't use a trailing \ after the folder containing the recovery disk files. When the batch file paused to tell you to close all explorer windows, I minimised the command screen and copied a "portable" folder into the ISO directory. Then I closed the explorer window and let it continue and that folder full of portable apps ended up in the ISO. I used your suggestion of "pstart portable" for a start menu and had it already configured to start the portable apps. I can now manually browse to the portable folder and start the menu and launch all my apps from there. Good catch on the license line! I did not change it from when it was hard coded to one location. And that pause to close explorer is an undocumented feature to add whatever portable files you want to. You can change system32\winpeshl.ini to start whatever you want. If you put the files in the mount folder, they will end up inside of boot.wim. This means that if you change it, it will revert to how it was saved originally. I also changed the filesystem of the ISO file. It is now ISO9660 and UDF 1.5. This means you can use the Windows 7 USB/DVD Download Tool to make a bootable flashdrive. See this post for more information. IF EXIST "%builddir%" ECHO "%builddir% already exists! Please delete it!" OSCDIMG -l"%isoname%" -u1 -b"etfsboot.com" ISO "%isoname%.iso"
I had an error on the line that wrote the license key file to the v2i folder. Here is a corrected batch file..